We present a rare case of exuberant and catastrophic brain metastatic lesions, predominantly with amelanotic pattern on MRI, that occurred early during the course of his disease. A 14-year-old caucasian boy was admitted to the hospital due to an ulcerated nevus in the left ear that started bleeding one week before. The lesion was ulcerated, with irregular shape and measuring approximately 2 × 2 cm. The remaining physical exam was normal. An excisional biopsy was performed and pathological findings indicated a superficial spreading melanoma, Clark level IV (invasion of reticular dermis), and Breslow's tumor thickness was 2.5 mm. Furthermore, wide excision including a 2.5 cm normal skin margins from the previous incision line was performed, along with biopsy of a newly diagnosed sentinel nodule. The node was positive, demanding left cervical radical neck dissection, which revealed regional metastatic spread. On the second month follow-up, physical examination depicted a painful left cervical mass which showed to be melanoma metastasis. Adjuvant radiotherapy was performed (50 Gy/25), twice a week. Six months later, he was admitted with symptoms of intracranial hypertension, presenting dilated and poorly reactive pupils. Brain MRI in a 3 Tesla Siemens equipment revealed numerous supra- and infratentorial lesions, the majority of them round and regular shaped, measuring between 5 and 25 mm. The majority of the lesions were hypo/isointense in T1-weighted images and hyper/isointense in T2-weighted in relation to cortex, and some presented spontaneous high signal in the T1-weighted images, the larger one in the left frontal region. Nodular enhancing pattern was seen after gadolinium administration [Figure 1]. There was considerable perilesional edema contributing to local mass effect and compression of 4 th ventricle/cerebral aqueduct resulting in hydrocephaly but with no interstitial edema. Also noted intraventricular lesion in the third ventricle and one left parietal skull lesion. The patient died 1 month later. In the study of Rodriguez-Galino et al., including 44 children diagnosed with melanoma, around 18% developed brain metastases during the course of their disease, with a median time of presentation of 20 months after diagnosis;  however in the present case brain metastases occurred in the first 6 months after diagnosis much earlier than expected. We present a case of severe manifestation of brain metastases of cutaneous melanoma with multiple supra and infratentorial lesions, predominantly with amelanotic pattern, along with intraventricular and skull metastases. As cutaneous melanoma is very rare in children, high level of suspicion is necessary to make an early diagnosis, which is crucial to the outcome of the disease. 1. Ferrari A, Bono A, Baldi M, Collini P, Casanova M, Pennacchioli E, et al. Does melanoma behave differently in younger children than in adults? A retrospective study of 33 cases of childhood melanoma from a single institution. Pediatrics 2005;115:649-54. 2. Richardson SK, Tannous ZS, Mihm MC. Congenital and infantile melanoma: Review of the literature and report of an uncommon variant, pigment-synthesizing melanoma. J Am Acad Dermatol 2002;47:77-90. 3. Isiklar I, Leeds N, Fuller G, Kumar A. Intracranial metastatic melanoma: Correlation between MR imaging characteristics and melanin content. AJR Am J Roentgenol 1995;165:1503-12. 4. Escott E. A variety of appearances of malignant melanoma in the head: A review. RadioGraphics 2001;21:625-39. 5. Rodriguez-Galino C, Pappo A, Kaste S, Rao B, Caln A, Jenkins J, et al. 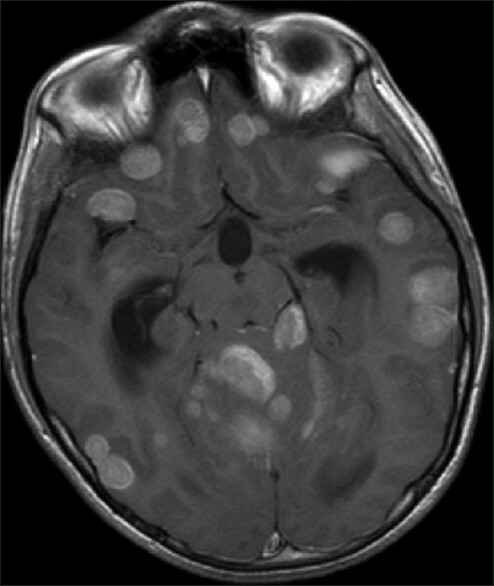 Brain metastases in children with melanoma. Cancer 1997;79:2440-5.